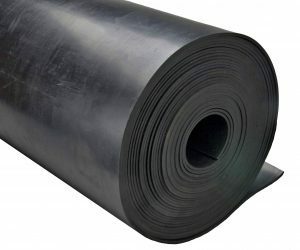 Nylon Reinforced Neoprene (chloroprene) Rubber, also known as cloth insert neoprene, is a high quality sheet rubber designed with an embedded layer of woven nylon for increased tensile strength. Offered in 48 inch wide rolls, it can also be slit to width or custom cut to your specifications. Nylon reinforcement is also beneficial for neoprene gaskets with holes that are spaced closely. Neoprene has excellent cold weather characteristics. Also available without nylon insert for general service applications where tensile strength is not of issue. **Lbs / Ft is based on 48 inch standard roll width.